Fascial Movement Taping is a rehabilitative taping technique that is designed to facilitate the body’s natural healing process. It provides support and stability to muscles and joints without restricting the body’s range of motion as well as prolonging the benefits of manual therapy administered within the clinical setting. Latex-free and wearable for days at a time, the kinesiology tape is safe for populations ranging from pediatric to geriatric, and successfully treats a variety of orthopedic, neuromuscular, neurological and other medical conditions. Fascial Movement Taping is a therapeutic taping technique not only offering our patients the support they are looking for, but also rehabilitating their affected condition as well. By targeting different receptors within the somatosensory system, the tape alleviates pain and facilitates lymphatic drainage by microscopically lifting the skin. This lifting affect forms convolutions in the skin thus increasing interstitial space and allowing for a decrease in inflammation of the affected areas. Based upon years of clinical use, Kinesiology Tape is specifically applied to our patients based upon their needs after evaluation. The findings of the clinical evaluation or assessment dictate the specifics of Kinesiology Tape application and other possible treatments or modalities. 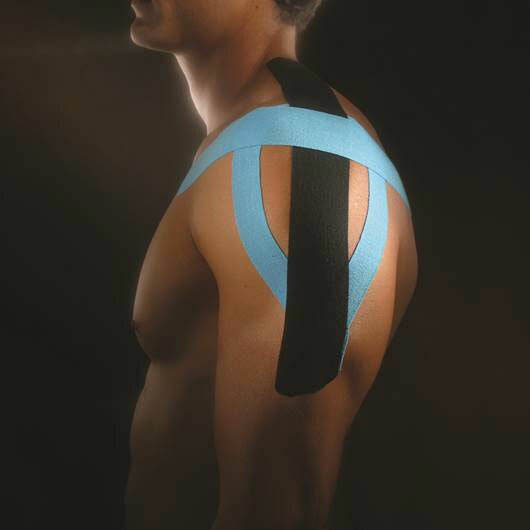 With the utilization of single “I” strips or modifications in the shape of an “X”, “Y” or other specialized shapes as well as the direction and amount of stretch placed on the tape at time of application, Kinesiology Tape can be applied in hundreds of ways and has the ability to re-educate the neuromuscular system, reduce pain / inflammation, enhance performance, prevent injury, promote good circulation, accelerate healing and assist in returning the body to homeostasis. Evaluation and assessment are key in the treatment of any clinical condition. In order to get the desired results from a Kinesiology Tape application as well as any other treatment, a full assessment of our patients is necessary. In some cases, the treatment of a condition may require treatment of other underlying conditions as well. This assessment should include manual muscle testing, range of motion testing, gait assessment, and any other orthopedic special tests that our doctors may deem necessary. The information gained from these assessments will allow for the proper treatment protocol to be laid out. Kinesiology Tape has been proven to have positive physiological effects on the skin, lymphatic and circulatory system, fascia, muscles, ligaments, tendons, and joints. It can be used in conjunction with a multitude of other treatments and modalities within our clinic and is effective during the rehabilitative and chronic phases on an injury as well as being used for preventative measures. Muscles constantly extend and contract within a normal range; however, when muscles over-extend and over contract, such as when lifting an excessive amount of weight, muscles cannot recover and become inflamed. When a muscle is inflamed, swollen or stiff due to fatigue, the space between the skin and muscle is compressed, resulting in constriction to the flow of lymphatic fluid. This compression also applies pressure to the pain receptors beneath the skin, which in turn communicates, “discomfort signals” to the brain; the person then experiences PAIN. This type of pain is known as myalgia, or muscular pain. 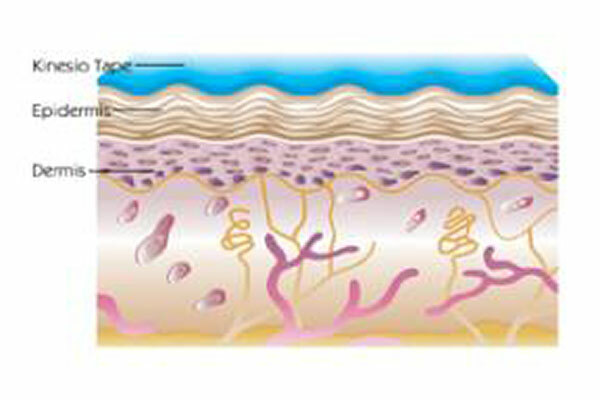 Illustration showing model of skin prior to Kinesiology Tape application. Conventional athletic tape is designed to restrict the movement of affected muscles and joints. For this purpose, several layers of tape must be rolled around and/or over the afflicted area, applying significant pressure; resulting in the obstruction of the flow of bodily fluids…an UNDESIRABLE side-effect. This is also the reason athletic tape is generally applied immediately before the sports activity, and removed immediately after the activity is finished. On the other hand, Kinesiology Tape is based on a different philosophy that aims to give free range of motion in order to allow the body’s muscular system to heal itself biomechanically. To ensure that the muscles have free range of motion, Kinesiology Tape is an elastic, malleable tape with an elasticity of 130-140% of its original length. This specific elasticity allows free range of motion while limiting an over stretch of the muscles themselves. It may look like conventional athletic tape, but Kinesiology Tape is fundamentally very different. For damaged muscle, the tape is applied UNSTRETCHED. In this case, we stretch the skin of the affected area before application of the tape. This is done by stretching the muscles and joints in the affected area. After application, the taped skin will form convolutions when the skin and muscles contract back to their normal position. 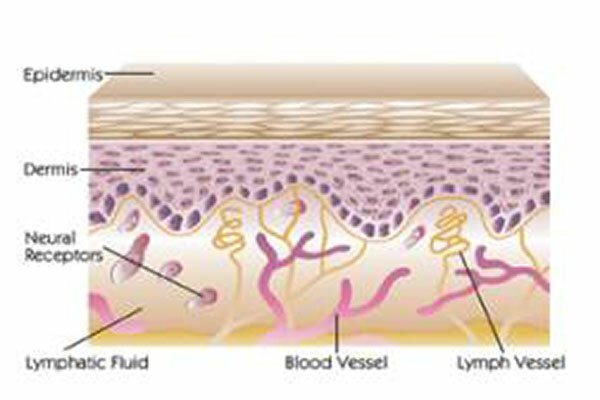 When the skin is lifted by this technique, the flow of blood and lymphatic fluid beneath the skin improves. Kinesiology Tape alleviates pain and facilitates lymphatic drainage by microscopically lifting the skin. The taped portion forms convolutions in the skin, thus increasing interstitial space. The result is that pressure and irritation are taken off the neural and sensory receptors, alleviating pain. Pressure is gradually taken off the lymphatic system, allowing it to channel more freely. Taped area forms convolutions then it increases the space between the skin and muscles and promotes the flow of lymphatic fluid. On the other hand, if joints or ligaments are injured, the tape is STRETCHED before application to the skin. The damaged joints or ligaments are incapable of functioning normally and rely on stretched tape for correction. It is also important to note that while depending on the injury, tape is either stretched or not stretched, this does not mean that the actual application technique will change. Kinesiology Taping is based on a different philosophy that aims to give free range of motion in order to allow the body’s muscular system to heal itself bio-mechanically.